Published in VAULT: Australasian Art & Culture, Issue 9, 2015. Working exclusively with unfired clay, Romanian-born artist Anna-Bella Papp creates minimalist sculptures bubbled with lunar voids, rippled asymmetries and ghostly imprints. 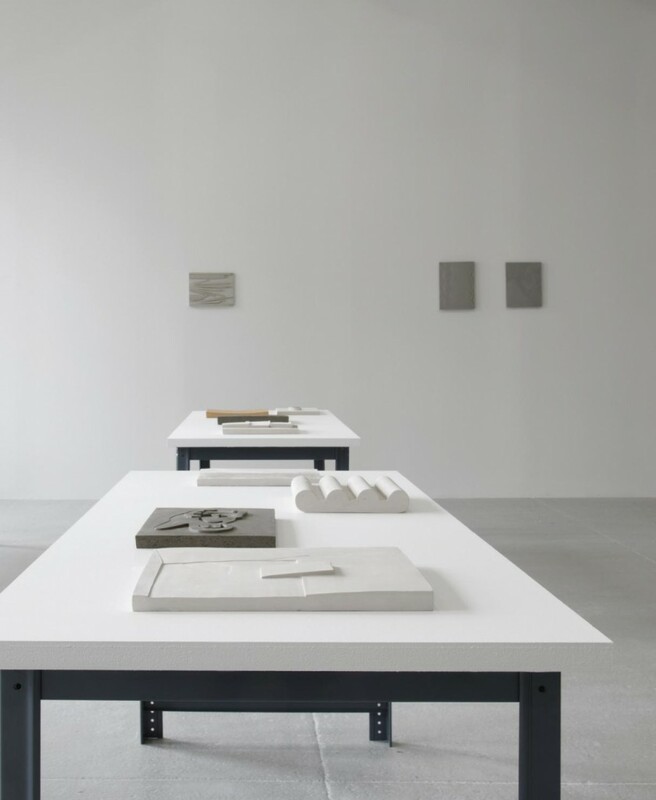 Mostly rectangular in shape, the slabs rest on tables and plinths, rarely on walls, calling for a three-dimensional survey that triggers eyes to dart down and heads to skate sideways – the same bird’s eye view experienced by the artist during the making process. While these grey-spectrum slabs bring to mind archaeological excavations or architectural templates, there is also a perception of modernity to their surfaces, a reminder that the most ancient material in the world can also be the most malleable. At only 26, Papp has already ticked off her first American solo show – at the prestigious Nasher Sculpture Center in Texas no less – and is about to deliver her second solo offering at London’s Stuart Shave/Modern Art, which also devoted an entire booth to her works at the Independent art fair in New York in 2013. Currently based in Rome, Italy, the artist talks to VAULT about her process. What is it about working with unfired clay that captivates you? There are many aspects. Firstly and most importantly, I can work with clay without any assistance or technology. Secondly, clay is a reversible process; no wonder it’s been used extensively as a method for preliminary studies and sketches for sculptures. Metaphorically, the medium retains the fragility of a thought, and the potential of becoming something else. I also like clay because it comes in these neat packages – in a state between solid and liquid – which puts everyone’s imagination at work. The differences between types and colours are also interesting, as well as the slight alterations occurring spontaneously after I finish working. This is when the material starts to dry, shrink, and sometimes warp or curve, and change in colour. You studied digital photography, graphic design, video and 3D animation at the University of Art and Design (Romania). Do you have plans to expand to other media, and the equipment and technology that come with them? Or do you prefer the primitive and hand-steered aspects of making clay? I think about clay as something timeless, not necessarily primitive, just very basic. It’s a raw material like wood or stone, and has been used since the beginning of time, and is a fact that enables me to play and balance the ancientness with the newness. Subscribe to VAULT Issue 9 to read the full feature. Image: Anna-Bella Papp, exhibition detail, Independent, New York, 7-10 March 2013. Courtesy of Modern Art, London.